Through the aid of some anti-Trojan downlods (VundoFix and ComboFix, as it happens – my AdAware and SpyBot were darned useless), I have managed to negotiate a peace treaty with the computer viruses and have been virus-message free for a few days. I suspect this is only temporary and that the mind-wipe will need to happen after a matter of time, but for the moment I am pleased to have some progress at any rate. In other news, I promised reports on the Korknisse. While I know logically that these are meant to be representative of Scandinavian folklore, and that by rights they shouldn’t really appear in multiple colours in, say, February, as opposed to appearing in red in, say, December, these little darlings have such a disarming amount of cuteness that I cannot help but return to them. 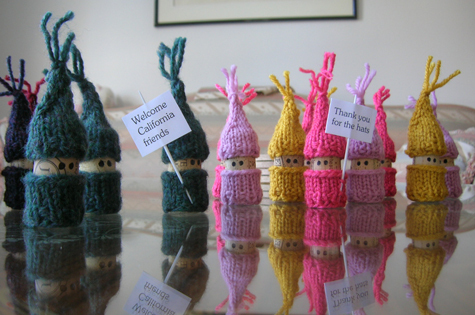 I can report that ten California corks were welcomed into the flock this week, and were suitably outfitted in bright and sunny hats and sweaters. They seem to be managing well in the cold with their new attire (and just as well, since we are forecast to have yet more snow this week). Currently these cork creatures number 51, and I would like to make it to 100. It’s nice to have specific and frivolous goals sometimes, you know? Very cute. I’m curious to see what you will do with 100 korkies, though. Not like I’m one to talk- I have plastic toy sheep incoroprated into my decor. No, I don’t have any children. oh my gosh – they are so cute!!! you will have quite the little army! They are great! I love the luminous colours! okay, seriously…they are tooo cute. I need to drink more to keep you in corks. I think i shall start tonight. Awesome. I can’t wait to see the whole ‘century’ of them! 1. Awww, California friends! Frankly, though, I think it should be the other way ’round, since we are having our lovely annual “It’s spring! ….Psych!” week, and you are, well, still having winter. 2. GLENNNNNAAAAAAA. I do not like this “No Glenna on LJ” game. I misssssss you! We must chat. Also, I must remember the password IJ account I set up a billion years back, because public-only posts just aren’t the same. very cute! 100 is a lovely goal, and any goal that requires wine drinking and knitting can’t be bad! These are just awesome. Hehe. Adorable. Love the signs. They make me smile! Oh wow! I had no idea there was such a large California contingency here! I would send you corks but I’m almost but not quite old enough to drink legally (here). But I’m not sad that I can’t contribute; it’s hard to be sad when the Korkinesse are too cute for words.